Myanmar Court Rejects Appeal Of 2 Imprisoned Reuters Journalists Wa Lone and Kyaw Soe Oo were reporting on a massacre of Rohingya men when they were arrested and later convicted of violating the country's Official Secrets Act. They were sentenced to seven years. 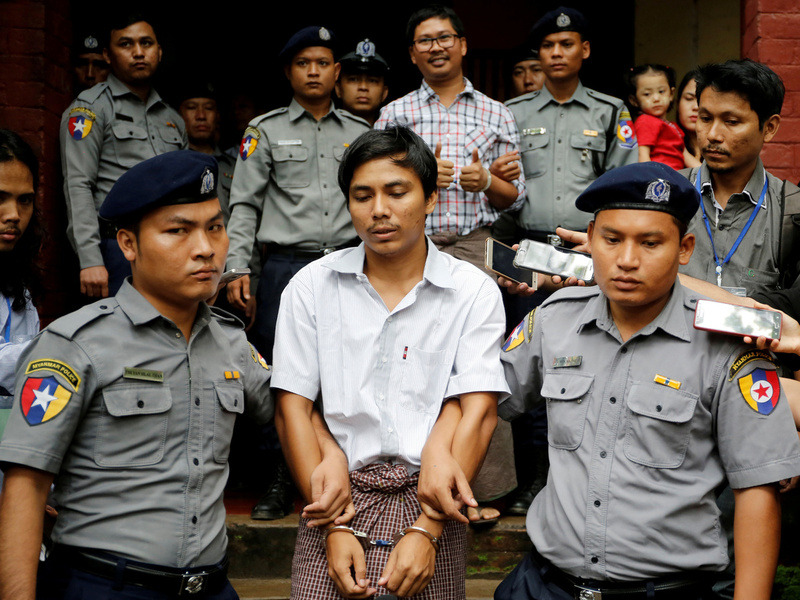 Reuters journalists Kyaw Soe Oo and Wa Lone were escorted by police after a court hearing in August 2018 in Yangon, Myanmar. A court in Myanmar has upheld the convictions of two Reuters journalists serving seven-year prison sentences in a case that has drawn international criticism and cast doubt on the state of democracy in the country. Wa Lone and Kyaw Soe Oo were found guilty last fall of violating the Myanmar's colonial-era Official Secrets Act. They were in Myanmar to investigate a massacre of 10 Rohingya men amid a military crackdown on the country's Muslim minority. On Friday, Yangon High Court Judge Aung Naing called the seven-year term "a suitable punishment," Michael Sullivan reports for NPR from neighboring Thailand. Defense lawyers had argued last month that the courts failed to prove the journalists intended to harm national security and wrongly placed the burden of proof on the defendants, Reuters reports. Reuters Editor-in-Chief Stephen J. Adler released a statement Friday calling the decision "yet another injustice" against the two men, who have been held for over a year. "They remain behind bars for one reason: those in power sought to silence the truth," Adler wrote. "Reporting is not a crime, and until Myanmar rights this terrible wrong, the press in Myanmar is not free, and Myanmar's commitment to rule of law and democracy remains in doubt." The journalists can still appeal their convictions to Myanmar's Supreme Court. The U.S. State Department denounced Friday's decision and called for the release of Wa Lone and Kyaw Soe Oo. "We will continue to advocate at all levels for the just release of these brave journalists," a State Department spokesperson wrote in a statement. The journalists' plight, and the violence they were documenting, have helped erode international hopes that the country would transition successfully into a democracy under de facto civilian leader Aung San Suu Kyi, a Nobel Prize winner. In 2017, Myanmar's military began a brutal campaign that forced an estimated 700,000 Rohingya to flee the northern state of Rakhine and cross the border into Bangladesh. Refugees have recounted organized rapes, the devastation of entire villages and mass killings. Wa Lone and Kyaw Soe Oo were reporting on an incident that September, when villagers and paramilitary forces in Rakhine state killed 10 people — fishermen, shopkeepers, students and an Islamic teacher — and buried their bodies in a mass grave. Police arrested the journalists in December and accused them of illegally possessing official documents. The journalists say police handed them the documents shortly before their arrests, in an encounter that defense lawyers have called a setup. The two were convicted in September 2018. Pressure has mounted on the Myanmar government to release the journalists, with calls coming from U.N. Secretary-General António Guterres and U.S. Vice President Pence. Wa Lone and Kyaw Soe Oo should be "commended—not imprisoned—for their work exposing human rights violations & mass killings," Pence wrote on Twitter. "Freedom of religion & freedom of the press are essential to a strong democracy." The two men were among the "Guardians" that Time magazine chose as its Person of the Year for 2018 for "taking great risks in pursuit of greater truths." Myanmar has also cracked down on its own independent press. Officials arrested three journalists in October for exposing a financial scheme within the government, Sullivan reports. Critics say Myanmar has used colonial-era national security laws, such as the law under which the Reuters journalists were convicted, to shut down investigations.